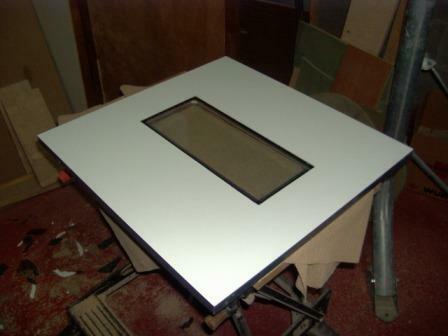 Once the rebate is made the door can then be covered with formica, both the sides and all arround the edges. If you use two diffeent colours of formica like i did, make sure you put the colours the right way round(oops when i realized it was too late) so now the glass is fitted from the inside rather than the outside as was intended. Stick the glass in place in the rebate using nuetral silicon as this gives off virtually no nasty vapours that may linger and damage any eggs. Once finished this can be put to one side so we can cover the rest of the main box.